We offer a wide range of Children Tents which are fabricated using superior quality raw material. Beautifully designed and sturdy manufactured range of our Children Tents are small in size and are easily manageable with easy setup. We provide these tents in varied specifications to meet the exact requirements of our valuable clients. These are made in keeping ease of children comfort and are best choices for our little campers. Creates a perfect sheltered spot to play. These pink and white colored Indian Children Tents have adequate spaces in which the children play with immense enjoyment. 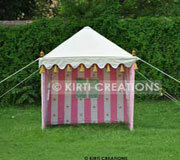 These light weight and portable Indian Children Tents can be easily carried anywhere.